Have you ever wanted to get back at your parents? Have you ever wished your gym teacher would find out what it feels like to suffer and gasp for breath? Have you ever just wanted to seek revenge in a major way? On the lighter side, have you ever thought about dating a vampire? (Before you protest, that particular story was written way before Twilight hit the shelves.) Perfect for fans of plotted fiction, Extremities contains thirteen stories that delve into darkness and evil, with a blend of natural horrors and supernatural encounters. You'll notice there is no Amazon link. 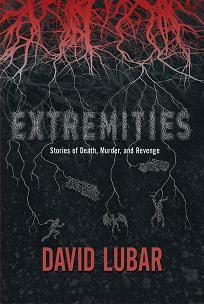 To learn why, and to get a look at the book's twelve-year odyssey from idea to publication, please read "Why Extremities Matters to Me."